Tucked away in a peaceful nook of Eltham, Ginger Garlic is a good place to enjoy a hearty Indian meal. The food is fresh and flavoursome. The menu, which appears like a book, has heaps of options to choose from. They offer dishes from various regions of India, however, not all the options are available everyday. They have specials in the form of regional food available on specific days of the week, while a standard (and generous) list of dishes are available daily. The only drawback with the place is its size. The tables are squeezed close to accommodate 40 people, though there is outdoor seating too. Nonetheless, this can be overlooked owing to the fact that the food is good and provides value for money. Most of the entrees are under $15 while the mains are under $20. They also have take-away option. Despite the modest size, it's a popular place, especially amongst the locals. Incidentally, I've always been there on weekdays and still found it bustling with people. For bookings or to find out more about the specials, contact the restaurant at (03) 9439 4423. Special mention: Kebabs and 'Balti' curries. 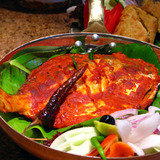 The unique seafood dishes – an interesting twist on subcontinent flavours – are worthy of credit too. Why? For a hearty Indian meal. When: Tuesday to Sunday 5 pm-9 pm. Thursday noon-2 pm.